ID: Thin but dense white/grey extensions that are highly branched from a common stem. 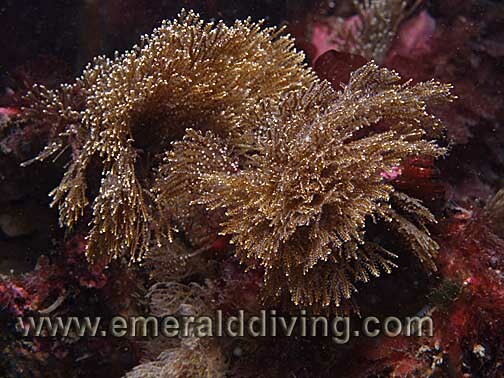 Comments: This hydroid is fairly common throughout the San Juan Islands. 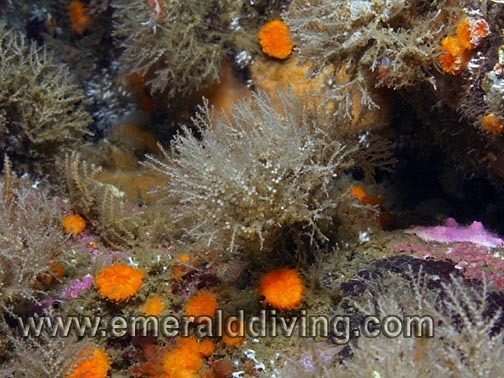 I only note this species on current swept rocky reefs. 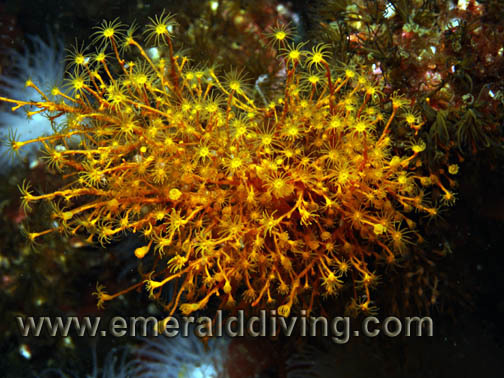 ID: Orange polyps and branching stems. Comments: As all hydroids are filter feeders, they need a solid footing and ample current, and this hydoid is no excepetion. These colorful little hydroids are common in parts of the San Juans, Strait of Juna de Fuca, Cape Flattery, and vancouver Island area. Photographed at Pearse Island in the Johnstone Strait, British Columbia. ID: Feather-like appearance, usually grows in dense clumps. Commentst: I only note the elegant looking ostrich hydoid on current swept rocky reefs inthe San Juan Islands and the Cape Flattery area. This hydoid tends to grow in bushy aggregations, as pictured. ID: Pink, flower-like polyps on long, thin stems. 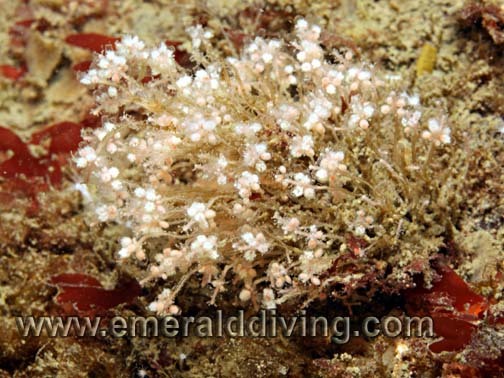 Comments: This tiny hydroid is often overlooked, but close examination will reaveal a stunning flower-like animal. 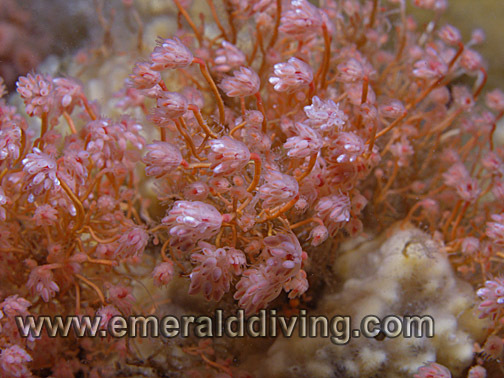 I often note extensive colonies of the pink mouthed hydroid on the Diamond Knot, in the San Juan Islands, and the Cape Flattery area. ID: Dense collection of yellow feather-like branches. 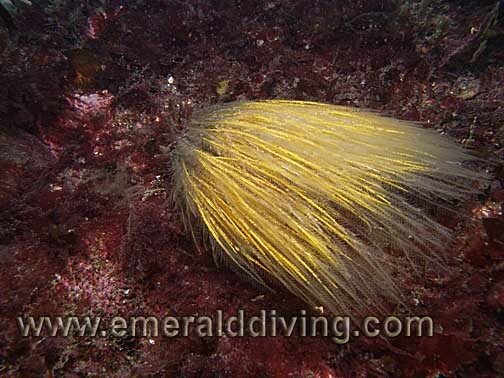 Comments: This hydroid is somewhat similar to ostrich plume hydoid in appearance, but much finer and yellow in color. If the current wasn't running hard, this hydroid would stand about 7" tall. Photographed at Shark Reef in San Juan Channel, a high current area, at 50 fsw. 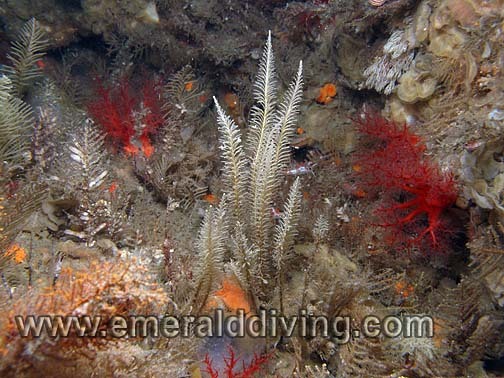 ID: Small pink polyps and single non-branching stems . 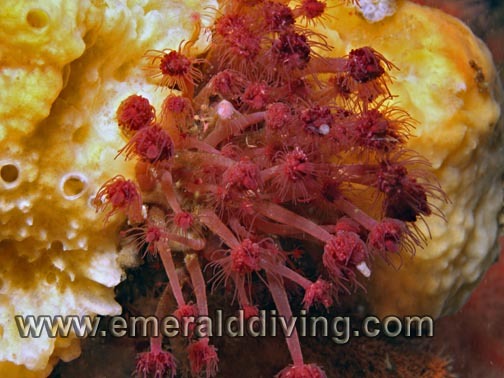 Comments: This bushy little hydroid is very similar in appearance to the pink-mouthed hydroid. However, it's polyps are much smaller. Photographed in Tumbo Channel in the Gulf Islands. ID: Solitary opposing smooth branches from a common stem. 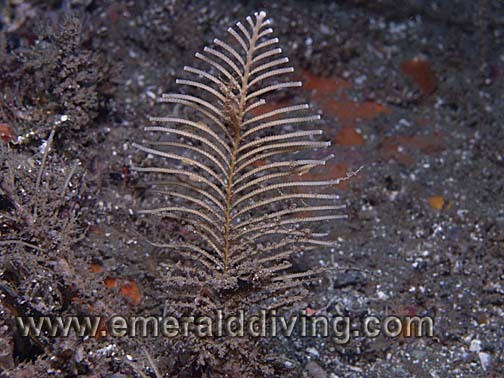 Comments: I have only noted this hydroid while diving Shark Reef in San Juan Channel in the San Juan Islands. I found clusters of this hydroid in the heavy current in 50 fsw. 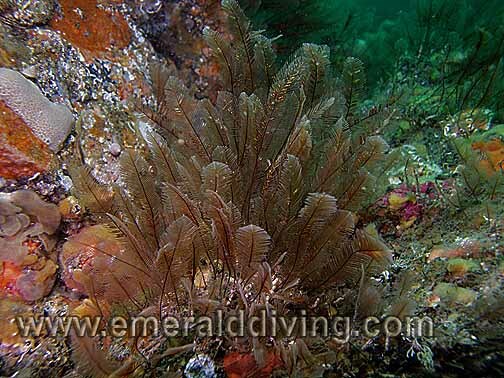 Comments: Same species as above, but this photo of the glassy plume hydoid shows it as I commonly find it along the cope as it clings to the stalk of kelp in high surge areas. Photo taken at Mushroom Rock in the Cape Flattery area. ID: Solitary. Pink center surrounded by tentacles. Comments: This is a fairly common hydroid that I note throughout Washington waters. However, because of its small and delicate size, I only note it when I actualy look for it. 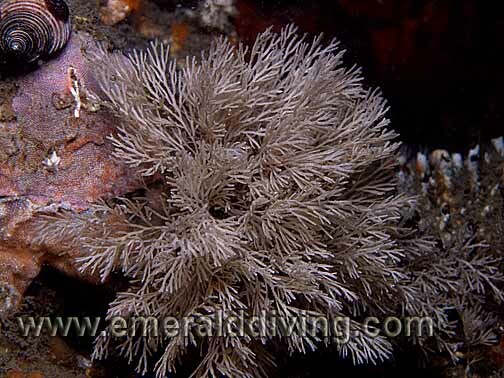 Like many hydroids, this hydroid is a favorite hood items for several nudibranchs. Photo taken at Flagpole Point in Hood Canal. 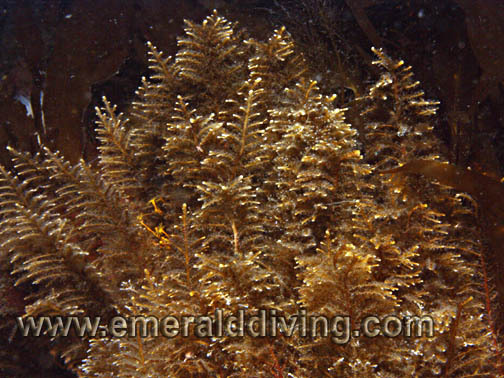 ID: Brown/tan hydroid with branches that grow in a loose spiral fashion. Comments: I note this hydroid on soft substrates. 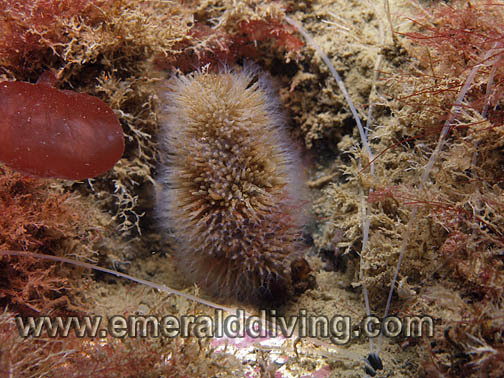 Note the variable nudibranch (Dendronotus diversicolor) feeding on the hydroid. Photo taken at Three Tree Point. ID: Brown matting with small extending tubes covering entire surface. Comments: This is another hydroid that I rarely note, probably because it is small and inconspicuous. I found this specimen on the rock mound above the wall at Flagpole Point in Hood Canal. ID: Single stem with narrow branches on either side. Yellowish brown in color. Comments: Another of the inconspicuous hydroids, although this one is a little easier to discern with it's slender profile. Photo taken at Long Island in the San Juan Islands. ID: Single branches emanating from a central stalk. Branches are medium in diameter. Yellowish-brown in color. Comments: This entry captures several related species of sea firs. The branches for this entry are not diametrically opposed, as they are with the course and fishbone sea firs. Photo taken at Long Island in the San Juan Islands. ID: Thick and dense brown extensions that are highly branched. Pink spheres often appear at the end of the branches. 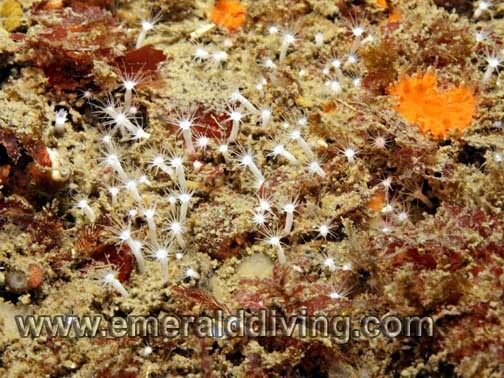 ID: Colony of small white polyps with tiny tentacles. 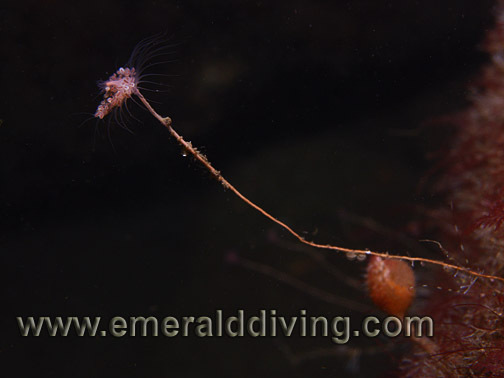 Comments: This little hydroid looks like a collection to tiny polyps. However, underneath it is an interconnected animal. 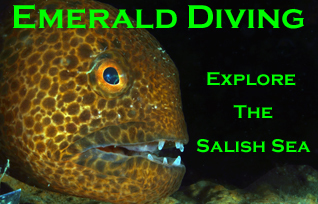 I have only noted this species in the San Juan and Gulf Islands. Photographed in Tumbo Channel in the Canadian Gulf Islands. ID: Thick dark red stem and polyp, grows in clusters. 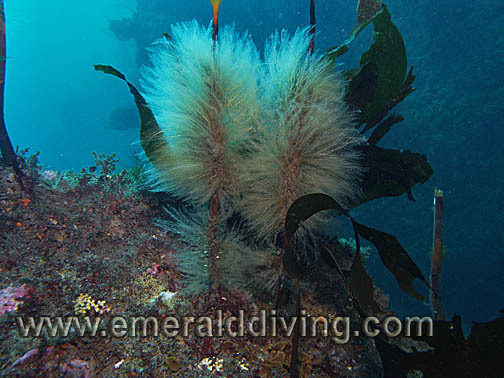 Comments: This species of hydroid has currently only been discovered off northeast Vancouver Island and is known to be the quarry of the pomegranate aeolid. Photographed near Pearse Island in the northern reaches of Johnstone Strait. ID: Thick, rough branches emanating from a common step. Often grows in aggregations. Comments: Another entry that captures multiple similar species. 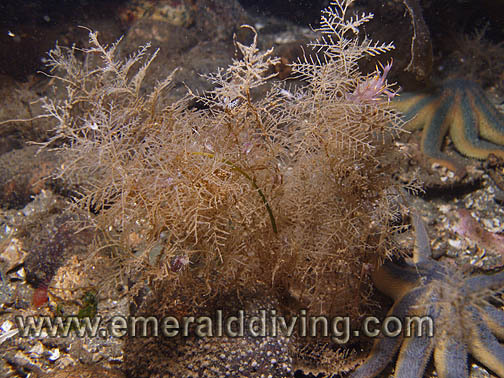 These hydroids are prevailent throughout Northwest waters. Photographed at Quatsino Inlet on the west coast of Vancouver Island. ID: Branching arms emminating from a single stem. Arms form a globe shape. 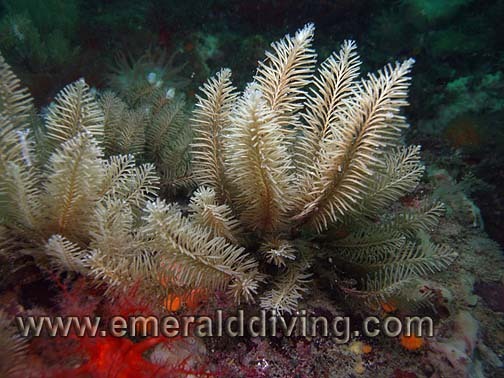 Comments: This unobtrusive hydroid is often looked as it vies for space in rocky, current swept areas. This hydoid obviously gets its name from its rounded, bottlebrush appearance. Photograph taken in Browning Pass, BC. ID: Polyps embedded on branches. Light amount of branching. Comments: I do not note this hydroid often. Another hydroid, the muff hydroid, looks very similar. Photograph taken at Ruth's Rock in Browning Pass, british Columbia. 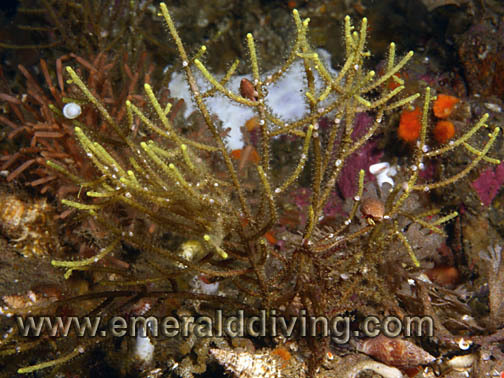 ID: Dense, highly branched hydroid. 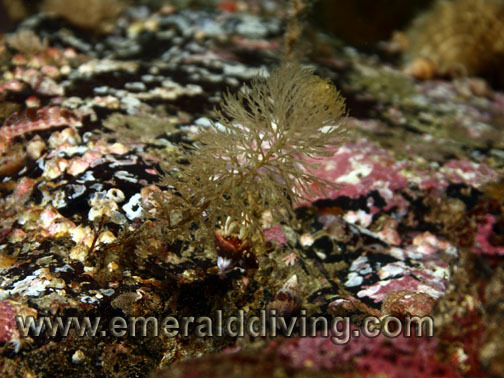 Comments: This is yet another of the unspectacular hydroid of our area that often go unnoticed by divers. I foten note the htdroid in colonies. Image taken at Tumbo Island in the southern Gulf Islands.